I sent out a call to the cast and crew that traveled with me this summer and the responses are trickling in. Here, for your consideration, are photos from Nick. Of our motley crew, Nick was the “let’s do it!” person, despite his nagging cold, cough, and runny nose. In most cases, Nick was the fastest of us, flying up a trail or humming down the road on a bike…Nick was/is awesome! On our rainy day hike; nice composition! Nick and Pandora waiting for the Shinkansen! Last days are often filled with trepidation; packing, getting to airports, figuring out subways, trains, and all of the other stuff that makes moving from one place to another a bit more hectic, a bit more strange. Our stay at the Machiya was generally good. I like staying in a house in which we can all be together and share the experience. While those moments can lead folks to feel cramped, overwhelmed, or sometimes claustrophobic, I’m convinced that the good outweighs the weird that can happen when a bunch of unrelated folks live together. From my perspective, this group worked together well and, generally, was an easy going collection of humans. Our travels home are a huge hurdle…after some changes to the flights as a result of United back in February, we fly back to San Francisco, to LA, and then, to just put that little bit of crazy, on a Southwest flight to ABQ. Our layovers are, in a word, ridiculous. Hours spent in airports are, to a great extent wasted. Sure getting time to go through immigration in Tokyo requires more than an hour, but much more than that and it feels a little crazy! The wacky is that we arrive in San Fran by about 9:00 AM and don’t make it to ABQ until 12:00! What?! What I can say for certain is that we all miss our peeps and are ready to share stories and plan more adventures! We woke this morning semi-prepared for a bike ride to Kinkaku-ji (The Golden Temple) and places in between. We walked a short distance to Happy Cycles, a small shop located just about a block from our house. The young woman fitted us on the bikes they had. Dylan and I, tall humans, had trouble with the small frames, but we pushed on as the day promised to be great weather. We Started off Really Well! As we rode down Gojo-dori street, it was clear that some of us were less adept at cycling. When I say, “less adept” you can politely read “holy crap we are going to crash!” A few folks in our number found the travel a bit more challenging than walking; in fact, a LOT more challenging. Our planned 20-minute ride of 5 miles took us a solid hour. As we rode, the heat took its toll on our bodies and we were all dehydrated by the time we made it to Kinkaku-ji. I bought loads of water and juices for us to drink. In addition to that small problem, a few of us had avoided breakfast and were absolutely spent. When riding a bike in Kyoto, the pathways are well-marked (remember LEFT side) and I have to say this form of transportation is the BEST way to visit this city. My advice: avoid the subways, trains, and busses and rent a bike (many places to rent bikes) for $8.00 a day! You can get everywhere in Kyoto…when I return to this city, I will definitely travel by bike. 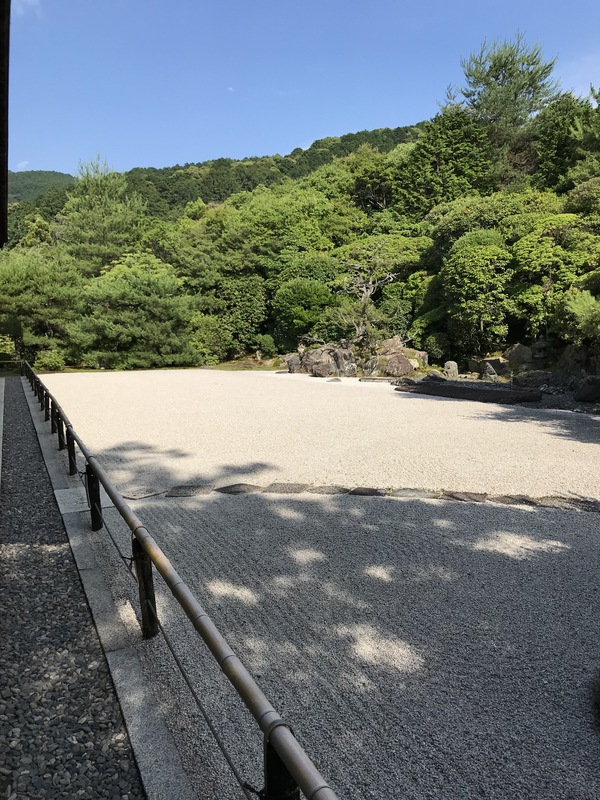 Our wander around Kinkaku-ji was, more than likely, a little less glorious than it might have been. I avoided taking pictures of the students because they requested anonymity on this day. 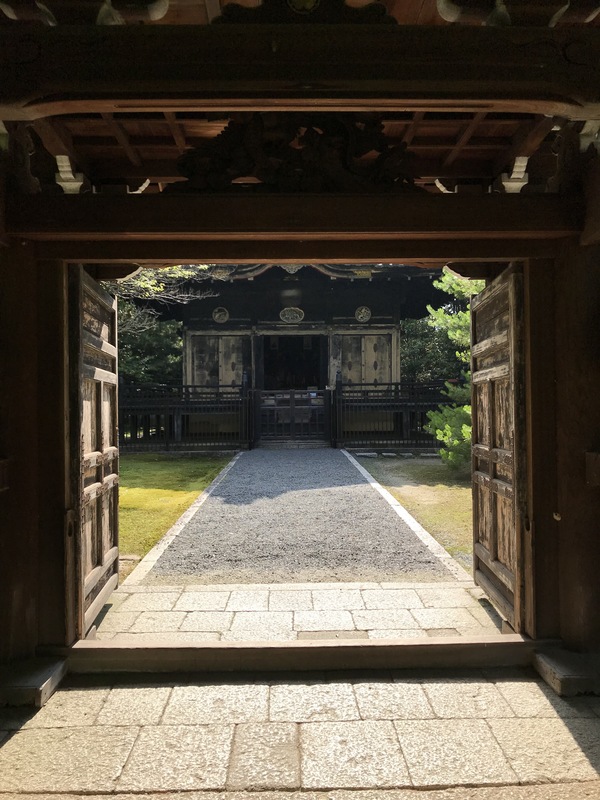 The site of the golden temple is in the middle of a business district, like many of the temples in Kyoto and Japan, but wholly a world apart once you are on the temple grounds. We gathered at the fence just across a pond from the edifice and it felt surreal. The bright gold glinted almost silver in the sun giving a kind of strange 3-D effect to the building and the surroundings. The reflection in the water was striking when the light breeze slowed, and I was mesmerized by the sight. This photo simply does not capture the light shining off the sides of the temple…. We headed around the trail and through the trees and despite the crowds, the place was serene. Jade, Hailey, Nick, Pandora and I made our way back to the beginning. We found Logan and Dylan in a heap settled along a rock wall. I bought more water and juices. Pandora felt faint; Logan felt a little ill. Everyone had seen a better experience to be sure. As we left the grounds, we decided to visit an annual flea market at Kitsune-Tengu Temple about three blocks from Kinkaku-ji. Had we been in a better state of mind, this festival would have been a place to stay for hours. I bought food for everyone and within a short while moods were improved. Judith, Sarah, and Hailey planned a ride from there to the Bamboo Forest and I took the rest of the group back to the house to recover and revive. The following video captures Dylan’s mood after food: the HONESTY, it burns! The ride back to the houses was almost entirely downhill. We coasted most of the way back taking us just 35 minutes to make it to the house. Once back, everyone took showers and rested in the late afternoon. As you might imagine, the entire group rallied for a walk to food. Nick found a small hole in the wall that served, you guessed it, fried chicken. Logan searched for something different; Dylan, Jade, Pandora and I went to a fast food noodle place not from our abode. When I say FAST food, I’m talking maybe 3 minutes from order to plate. The food was tasty (not great but cheap and filling), and we headed to a Lawson 100 Yen Grocery Store where all items are 100 yen (basically a dollar). I loaded up on some breakfast food has been my custom for the past few days. We’ve had cereal, bananas, grapefruit, tangerines, a kind of giant breakfast pastry, and toast and jam. As an aside, I’ve supplemented by unusual diet with beans and rice, prepackaged and very inexpensive. I can eat a hearty vegan dinner for three dollars. No joke. The Lawson stores can make ANY visit to Japan a much more financially reasonable approach to visiting this country. Tomorrow’s excursion is completely up to the folks on the trip; they wander wherever they want….I have a phone they can use to contact me, AND they have some rules to follow along the way. Lastly, tomorrow is our last day in Japan before we take our ridiculously long flight home (crazy layovers in airports). I’ll post a variety of trip photos in my next post….stay tuned! After a rainy day in the city yesterday filled with Manga and the Nishiki Market, we headed south to hike Mt. Inari through the Torii gates that dot the mountainside. The train ride from Kiyomisu-dera stop to the Inari stop takes about 10 minutes of nice, cool comfort in the steamy weather of this part of southern Japan. We got off the train in Inari and found ourselves caught up in a huge Sunday crowd. Sundays are days when Japanese families and friends get together and do something…in this case hike Mt. Inari. The walk up to the start of the hike was crowded with people in the very close proximity of the very narrow streets of the village of Fushimi. As one walks across the train tracks and into the town, the street, used by cars, becomes a walking path, not much bigger than a sidewalk. All along the way, street vendors offer everything from grilled rice cubes to skewered fruit to my personal favorite Okanomiyaki. This dish is a revelation if you have not encountered it: grated potatoes, vegetables, and additions like Bonita flakes, a sweet barbeque-type sauce made from Ponzo, and, finally, a Japanese-style mayonnaise that is slightly sweet. Judith grabbed skewered grilled rice balls (about the size of a 10 cent Japanese coin) coated with a sweet brown sauce. 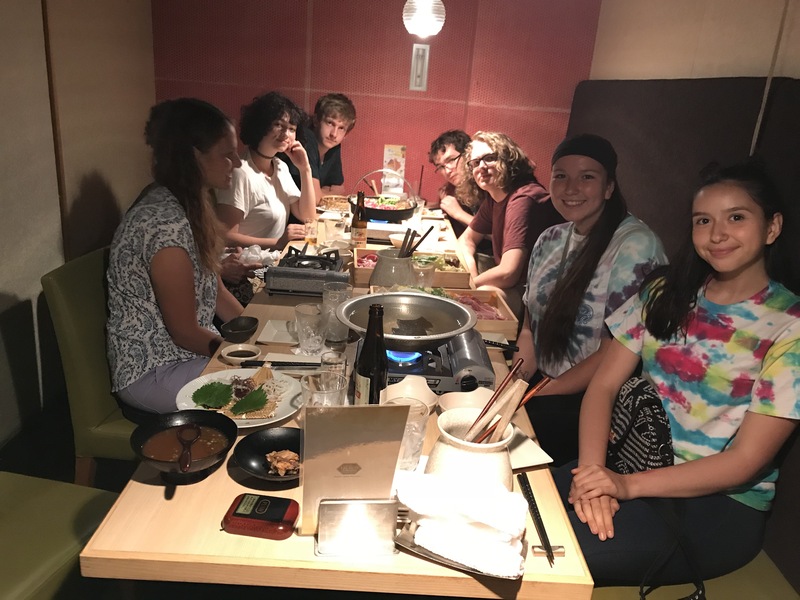 Logan, Dylan, Jade, Hailey and I dove into the Okanomiyaki. 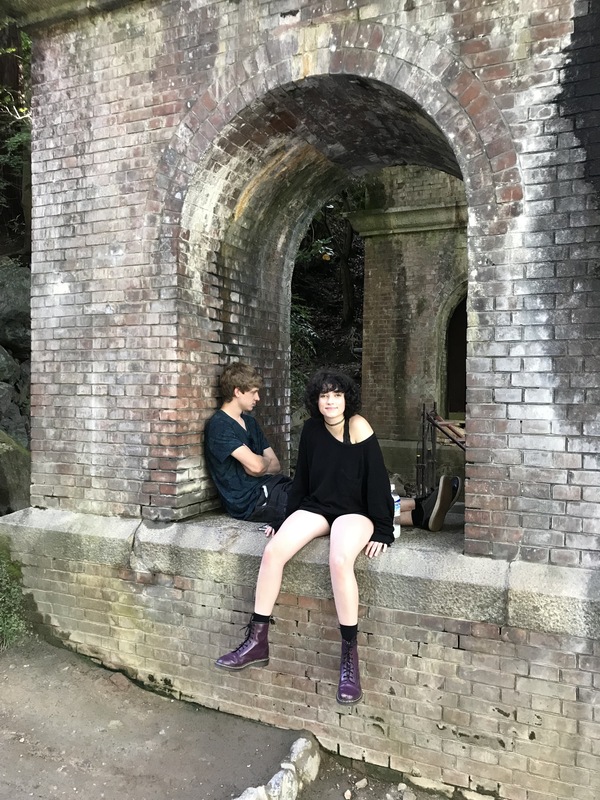 Nick, as has become his custom in Japan, ate fried chicken bites. 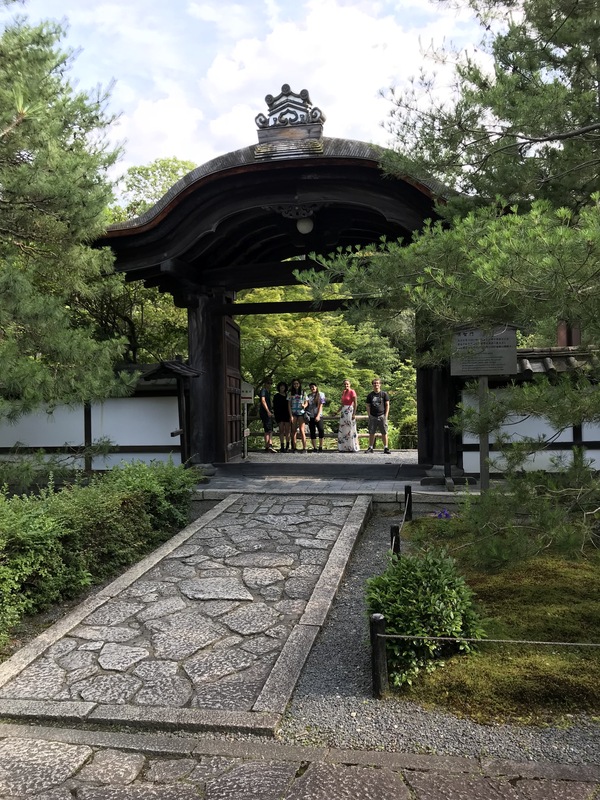 As we approached the temple complex, the numbers of people swelled…movement was really a challenge…we shuffled along, slowly up the first steps to the Torii gates. These vermillion red structures line the entire hike up the mountain. On one side are the numbers of each Torii and on the other a kind of prayer, saying. As you wind your way up the mountain and through the gates, the numbers of people dwindle to the point that, in sections, you walk alone. This phenomenon is fascinating…especially once you cross the mountain top (after section number 14) you could walk all alone for almost the entire way down! Ready for the Climb up Mt. Inari. Lots of People on the Path. …and then NO people on the path! Our group broke up into three distinct masses: the ones who practically ran up the trail, those who went up gradually, and those who stopped to take pictures. The entire journey of 4.7 miles took us about 2:00 hours (leisurely pace). It was hot, and we were filled with sweat despite the cool breeze amidst the trees and under the Torii. We all made it down in different groups and we went on a search for our friend Logan who, somehow, had become separated from his hiking partner Nick. Once down from the hike, the numbers of humans milling about made finding young Logan a bit of a challenge. We spread out, searched around and Dylan found him eating some wonderful food. Crisis abated! Problem solved. For a minute. I had sent Nick and Pandora to slowly search some of the small shops on the sides of the path toward the train station…then we promptly lost them! We searched for them and found them! Excitement! Thrills! We walked back to the Keihan line and jumped on the train for the short ride back to the city. Some of us crashed back at the house after the hike and the rest of us walked up to Kiyomiza-dera temple/shrine. The temple is directly up the road from where we are staying, and the walk was steep but easy. Since I have been visiting Japan, this temple has been under reconstruction. 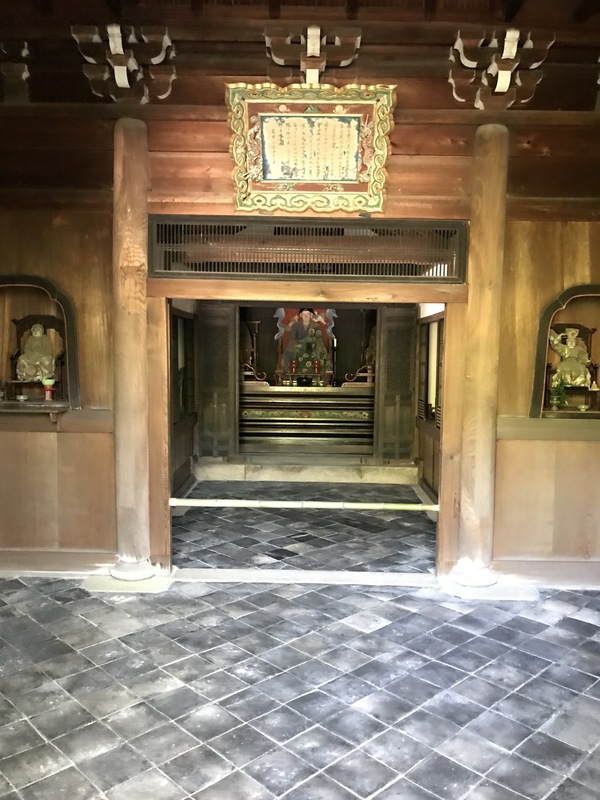 I talked to an attendant and he said the plan was to finish about two years ago, but they found drainage problems under the main part of the temple….the main building is situated in the steep side of a hill supported by huge timbers. 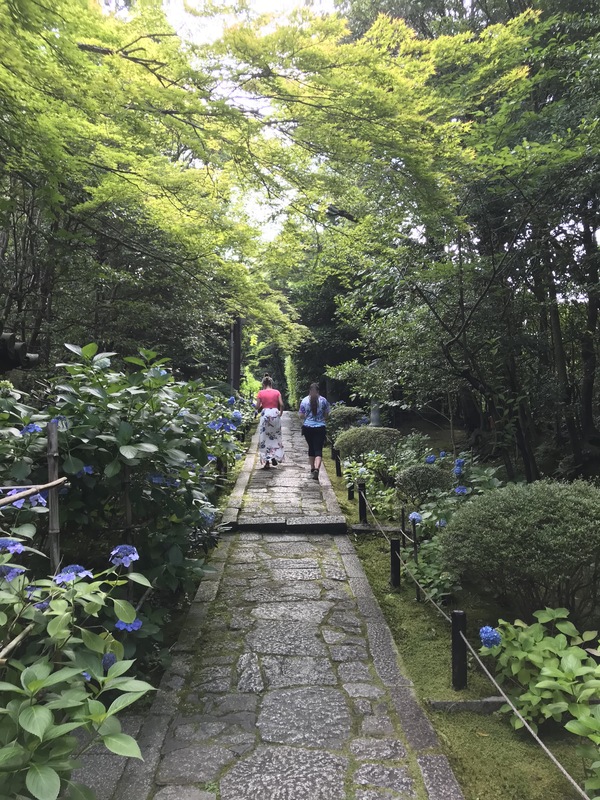 We wandered the grounds and much like the crowds at Fushimi-Inari, disappeared as one walks along the various paths through the trees and out to a distant Pagoda dedicated to children. On every way up to a hike is…a vending machine…in this case, selling Tappiness. After this visit, we headed back down to our house, directly down the hill. I ordered folks Domino’s Pizza for delivery (!!) and they chowed on pepperoni and cheese pizzas. A taste of home revived the lethargic group. Another successful day in Japan! Tomorrow, biking to Kinkaku-ji and the Bamboo forest in Arashiyama! 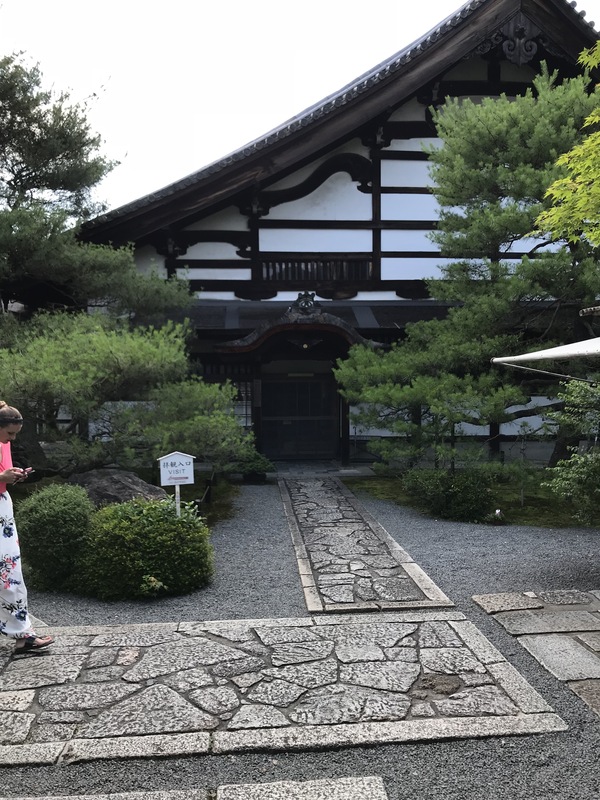 From Paro to Bangkok to Kyoto in four easy steps…. Leaving Bhutan is never easy. One gets into a rhythm in this place and it’s hard to get out or, better said, it’s hard to leave the land of happiness. Our last morning was filled with a kind of sad resignation reflecting on the interactions with people, the visit to Tshangkhap School and the moments spent hiking, hearing, and seeing this place and the people who live here. We boarded the plane to Bangkok (delayed because of weather) and flew to one of the biggest airports in the world. Once there, we quickly went through immigration and headed to our hotel, The Great Residence in Lat Krabang. 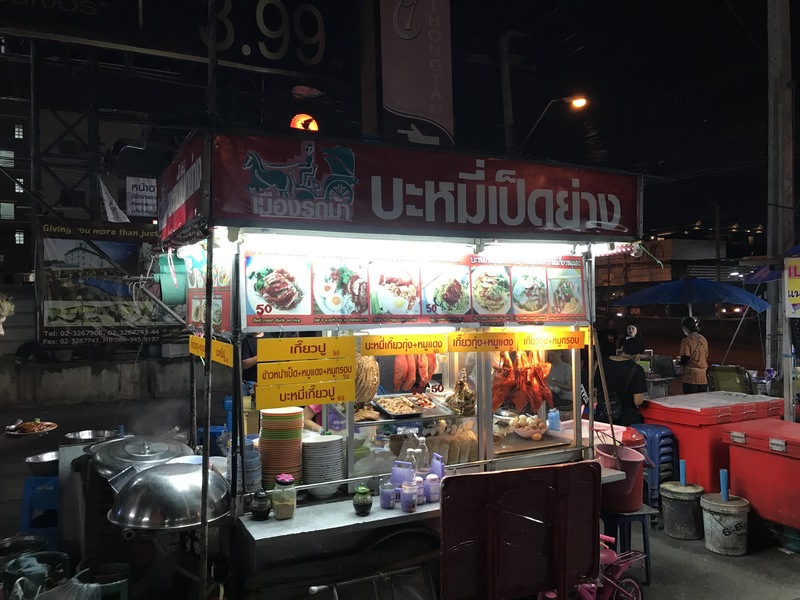 Our goal on this evening was to find some great street food in Bangkok and boy did we ever! 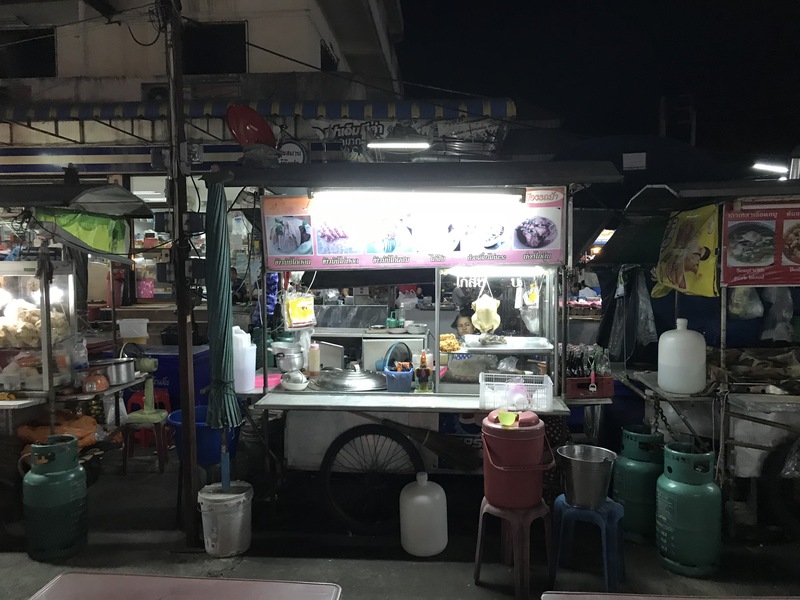 WE walked about 1/4 mile to a series of carts stationed at the corner of Lat Krabang road. The food ranged from understandable to bizarre. I imagine one of those Bizarre Foods episodes sitting among these carts sampling the fare. Our group sampled a wide variety of foods from the Crispy Duck Nick ate, to the multiple bowls of food consumed by Dylan and Logan. 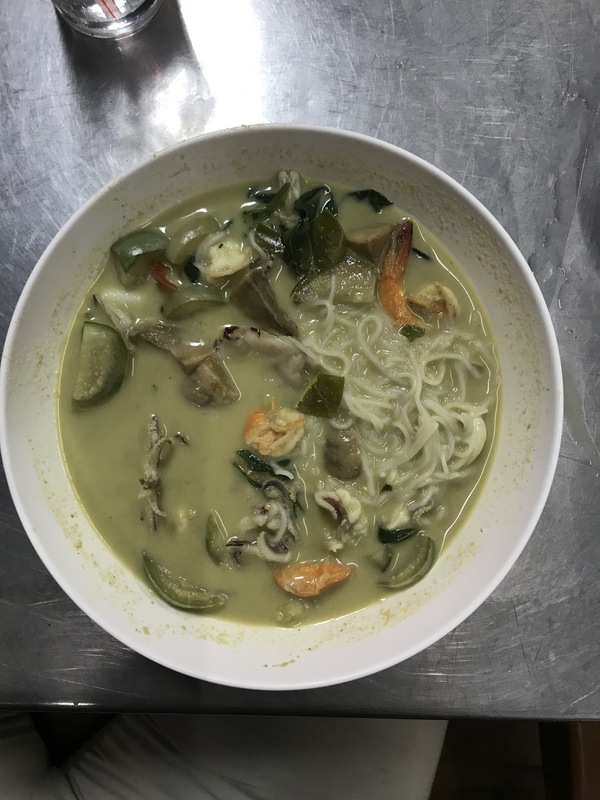 Judith introduced me to Green Papaya salad, a revelation, and Pandora and I went on the hunt for a Green Curry dish. 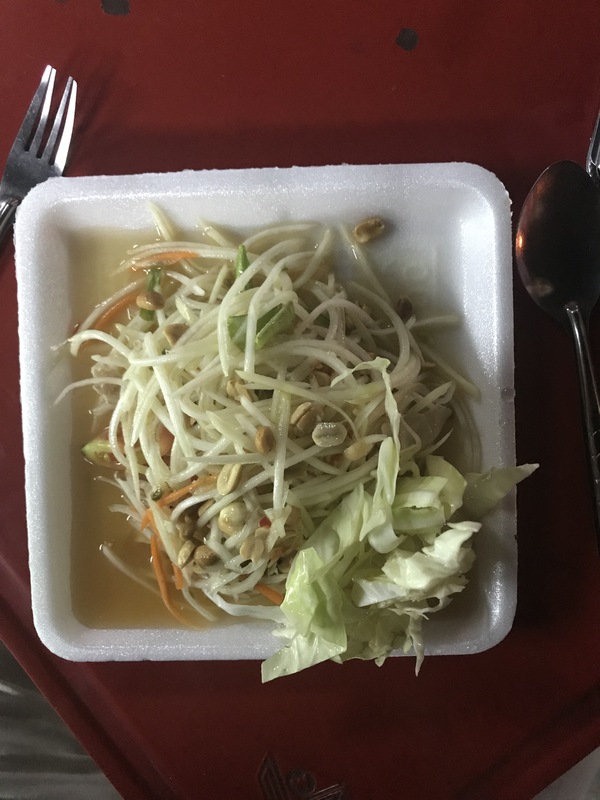 Jade found a homemade coconut ice cream that included toppings such as bobas, sweet beans, sweet potato chunks, and bean sprouts…fascinating toppings for ice cream! We all tried it. Our taste for Thailand sated we headed back to the Hotel. The place is clean and close to the airport which make the stay less stressful in the AM. We gathered for the van back to the airport at 7:00 and took off for Tokyo and Osaka by 9:30 AM. We landed at Haneda Airport in downtown Tokyo; this spot is the site of Tokyo’s first international airport. We had about three hours to kill and we did making it through immigration, finding food, and rushing to a last minute gate change! We arrived weary but ready for our ride to Kyoto. What made this moment so special was the growing fear that we would be stuck in Osaka for the night! Kansai transportation shuts down by about 10:50PM. We were supposed to land at 9:45PM…instead we were delayed by weather. We landed at 10:15….allowing us just about 35 minutes to get off the plane and to the taxi van I reserved for the trip. The company says, on their web site, that they promptly depart at 10:50…if you flight is delayed, too bad (in a much more amicable tone, of course). 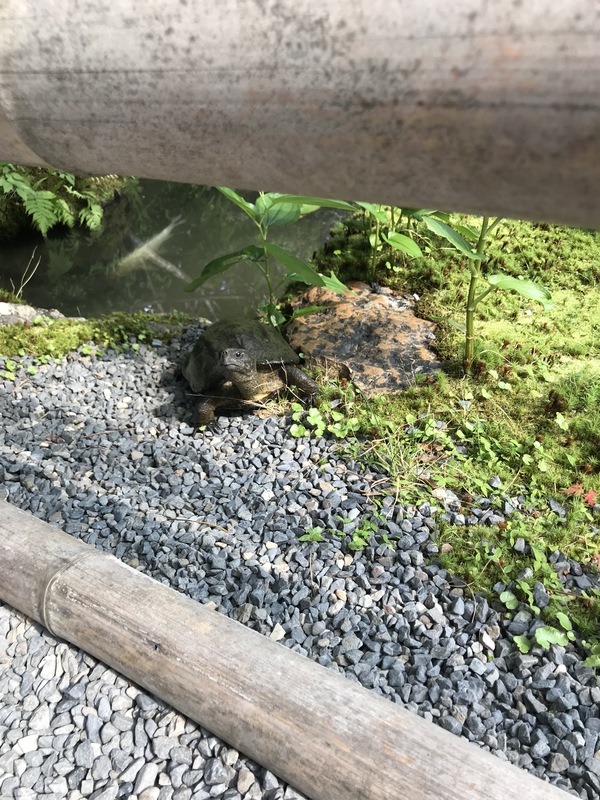 We practically ran off the plane to walk to the MK Shuttle desk…I can honestly say, having been in this situation a couple of times, I was concerned….however, we arrived, I checked us into the van and soon we were off to Kyoto! The houses I rent in Kyoto are Machiya, traditional homes in the middle of a neighborhood in the city. These tiny houses (probably the original version of the tiny house) have tiny stairs with sleeping rooms filled with tatami mats and futons on the floor, Anyone over about 5’9″ in height risks getting their head whacked on beams that support the ceilings! We arrived about midnight and went to sleep….much needed rest after the 12 hours of traveling. Our first day in Japan we walked to Kyoto Station to orient our group to the city. 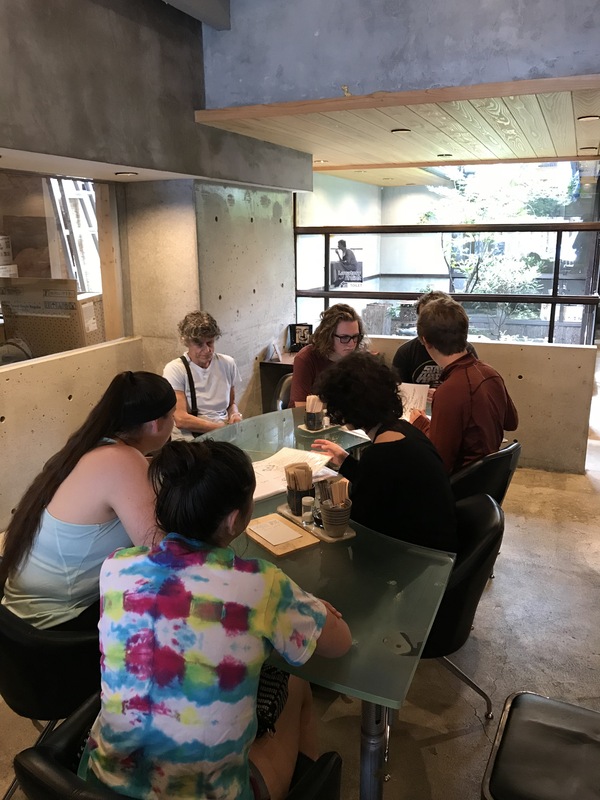 I will be turning the beasts loose in a couple of days to explore on their own…this morning was my orientation session….how to get around in Kyoto; how to use the subway and train system; how to find your way home; how to make good choices, etc. 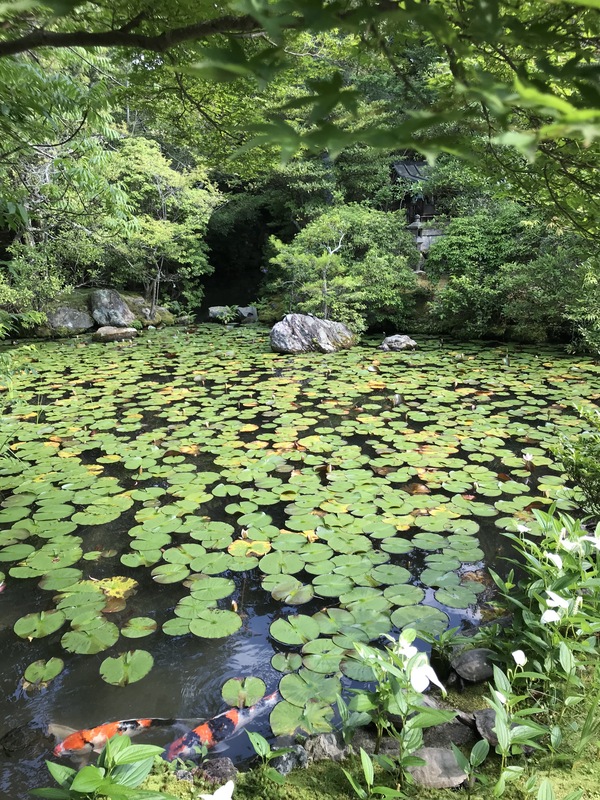 Once oriented and fed, we headed to the north Higashimaya region of the city and walked on the Path of Philosophy, an area filled with Buddhist temples, shines to former leaders of Kyoto, and the big prize, Ginkaku-ji, the Silver Pavilion. 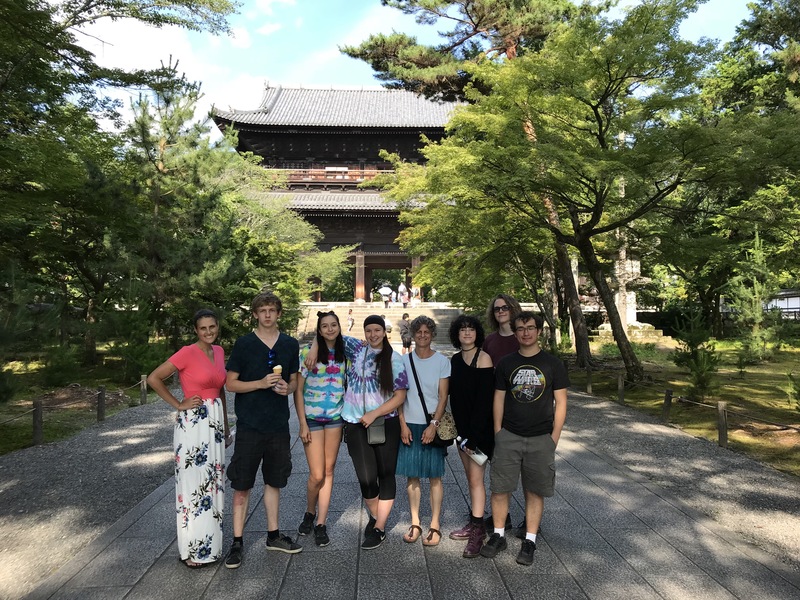 We made ti to Nanzen-ji before deciding that a few of us needed a break from the walking and heat. We headed back to the subway and on to the house were a few of us crashed for the late afternoon. Feeling refreshed and ready for the night, we headed out at 7:30PM for a food excursion….truthfully, there are so many choices for food in Kyoto it is dizzying. 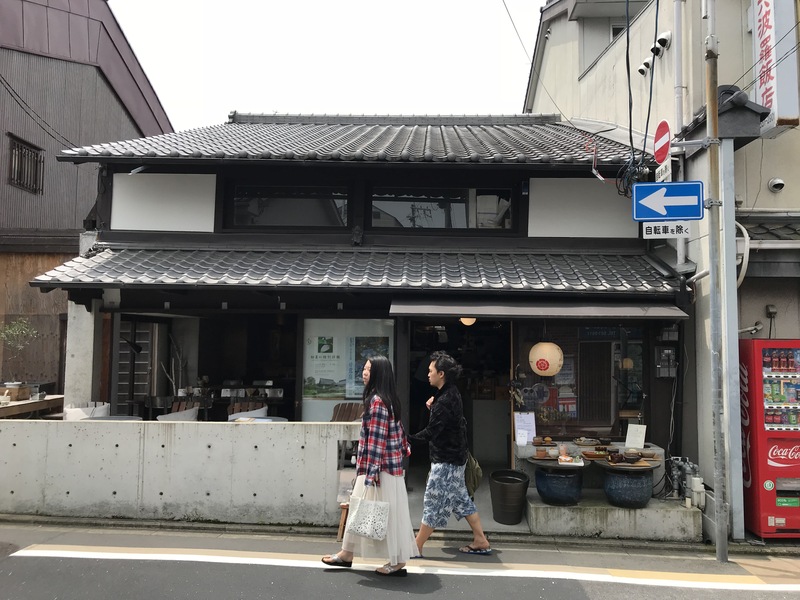 On one particular street near Shijo-dori, we saw, literally, dozens of places to eat…mostly small places dedicated to ONE kind of meal….Shabbu Shabbu, fried or grilled chicken, sushi, pizza (!!) and the like. We settled on a place to did almost every kind of Japanese dish…Senzai, and waited about 30 minutes for a private room. We ordered a variety fo dishes from Shabbu Shabbu to Sukiyaki to Sashimi to fried chicken (Nick!) to Salmon belly (Logan!). We had a great time just being together in this space, smiling each other’s dishes and having a great time. Leaving Bhutan on a Beautiful Day! 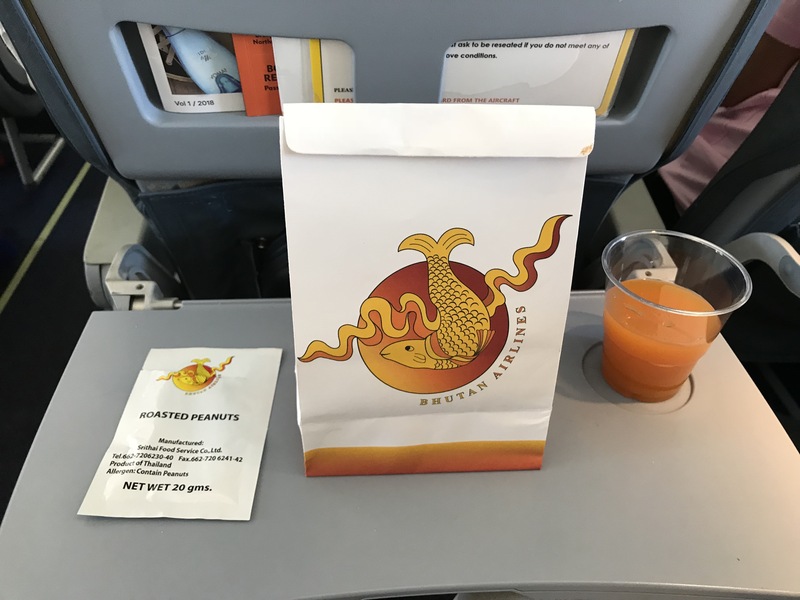 Even the lunches are cute…in this case, sandwiches made with Ema Datsi or cheese…don’t forget the peanuts and Mango juice! 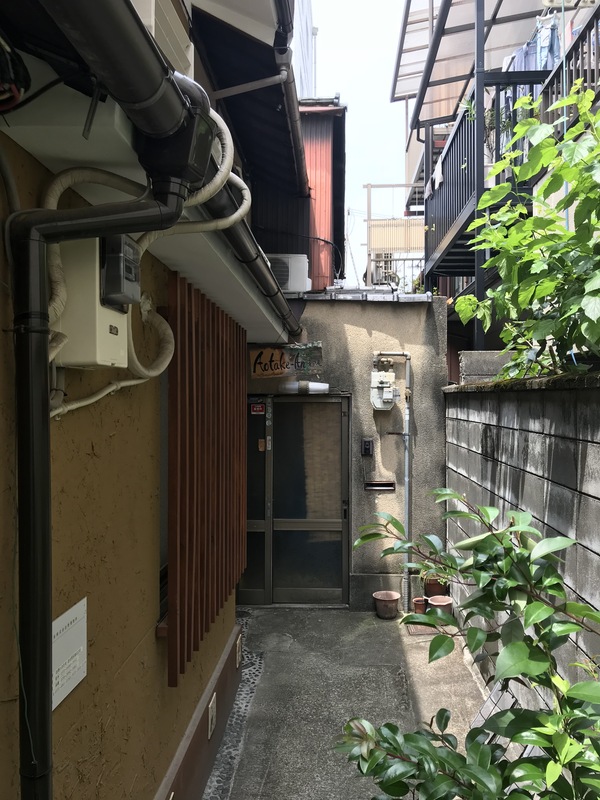 Our alley with two houses, Juichi-an and Aotake-an…can you find them? Sagan: a wonderful coffee shop steps from our door. 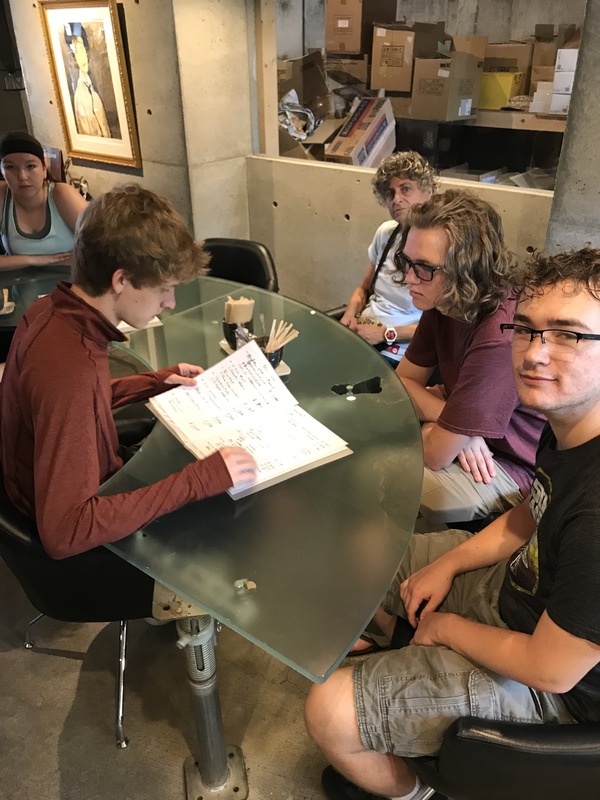 The biggest challenge in Japan: ordering food from a menu in Japanese. 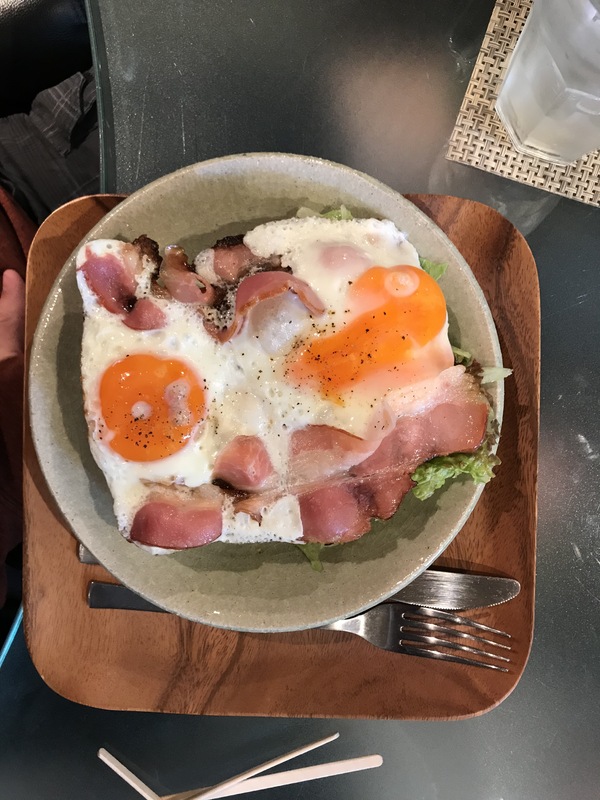 Dylan successfully ordered a bacon and egg on toast dish…NICE! Mausoleum to Tokugawa Ieyasu, 1648. 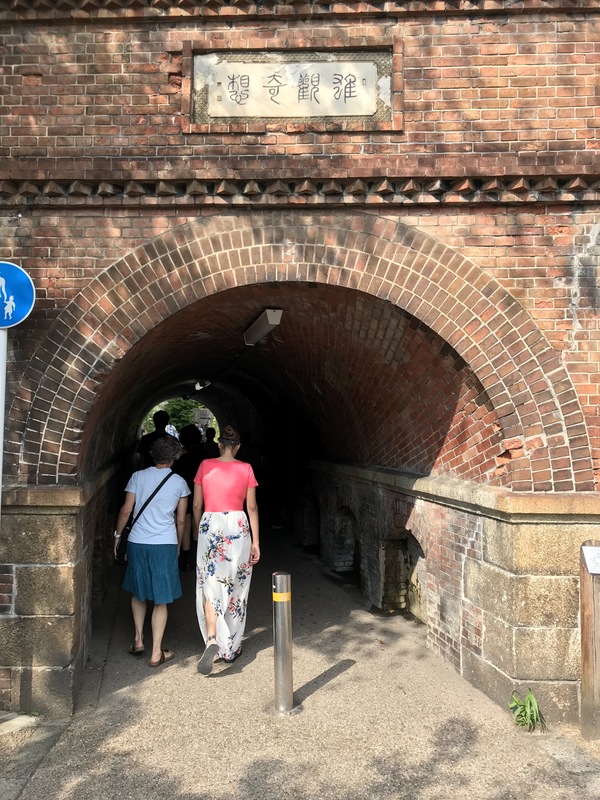 Walking under the Lake Biwa aqueduct to the Path of Philosophy. The temple to Nanzen-ji with some people I met along the way. Our long couple of days came to a relaxing end on our walk through Gion. We sighted Geisha on our walk through the Geisha district in Gion and made our way, slowly, back to our houses. The iconic photographs of the monastery perched on the side of a sheer cliff face are ubiquitous. A quick Google search for the site sends you to thousands of photos of this temple just to the north of Paro Town. 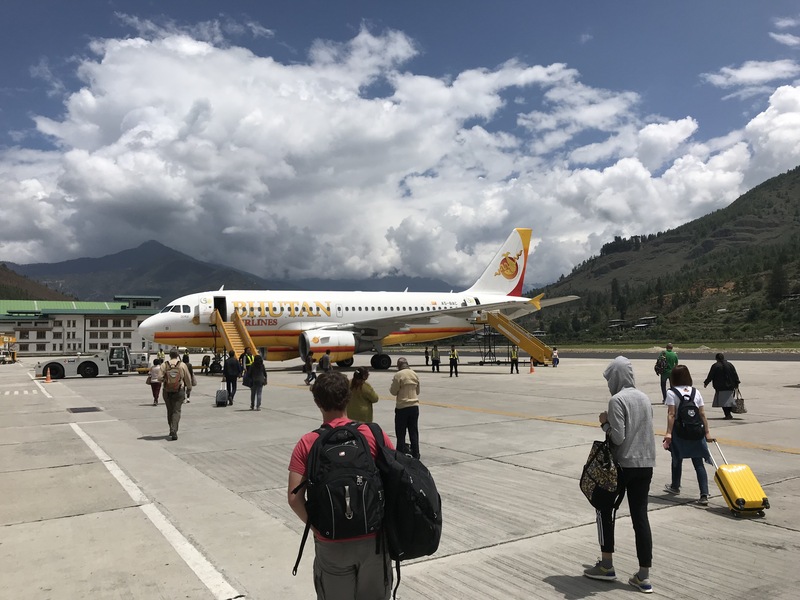 It has become a tourist tradition to end one’s travels in Bhutan with a final hike to the temple grounds and to visit the interior shrine rooms dedicated to Padmasambhava (and other important Vajrayana spiritual leaders). As the story goes, Padmasambhava came to this place to meditate, subdue demons, and bring Vajrayana to the people of Bhutan (and of course to Tibet, Nepal, Sikkim and elsewhere in the region). Padmasambhava or Guru Rinpoche, is the first teacher of Vajrayana and is considered the second Buddha. He made his way to Bhutan and meditated in a cave of resident tigers. The cave can still be seen, if you come at the right time, and the system of caves that fill the mountainside are impressive. Our trek up the mountainside and to the temple was a challenge in many ways. The trip leaves a lasting memory on everyone who makes it to the Taktshang. On this day, we started about 8:30AM. A few folks in our group chose to ride horses to the tea house situated across the ravine from the temple. We began our hike on a sunny day and made our way up, up, up. How many miles and what elevation gain? Total round trip was 6.7 miles. Elevation gain and loss was 2250 feet. Those numbers don’t really tell you the whole story. One gains and loses elevation on the way to the temple. In fact, in the last ¼ mile, one loses 800 feet and regains it on the same path (all in a series of mismatched steps). The path was muddy from days of rain and the plodding of horse hooves on this narrow path. As we started the hike, we followed about 10 horses on the way up. Some of us quickly decided to take another, less well-known trail taken by pilgrims to the temple. I learned of this trail on my last trip and a few of us climbed it. It was a much more direct route to the tea house and climbs nearly vertically. Some hand-carved steps were created in the dirt and the trail leads to a series of shrines hidden in the forest. The rest of the group meandered on the horse trail to the tea house and we made it in a little less than an hour…a fairly fast pace. We rested for about 15 minutes and then continued. The next part of the trail climbs about 900 feet in ¼ mile. The trail is wide but steep and well-trod. If this were a rainy day, the going would be a huge challenge. As it was, the sun bared down on us and we hiked together, mostly, on the way up. As you walk this part of the trail, the numbers of people thin and work at their own pace. As you amble along, its common to strike up a conversation with your fellow hikers. Most folks are from India and are eager to chat about the trek, your travels, and, of course, the United States government. While this blog is not a testimony to politics, every single person expressed concern for our country. I started to keep track of these expressions of concern and worry; of the people I talked to on this trip, all thirty people said basically the same thing: what has happened to the United States? After that first ¼ mile from the tea house, the trail flattens and you are ABOVE the elevation of the Tiger’s Nest at 10,550 feet. This gentle reprieve from the climb ends pretty quickly as you pass a small temple and then you see what is in front of you: stairs descending down the cliff wall, around the ravine and up the other side. Someone said there are about 2000 steps up and down. You descend steeply down the cliff face and lose elevation rapidly. Every single one of us was thinking: holy crap, we’ve got to come back UP these steps! The long climb to the temple. At the bend at the bottom of the stairs is a waterfall descending from the rock wall high above you. A small temple is here and a small bridge that crosses the ravine, open below you. You can see 1000 feet to the trees on a distant hill. Yikes! Once past the waterfall, the climb, again, begins to the temple itself. The steps wind around the cliff wall with a railing on one side. The steps get steeper as they rise until the last push to a police station and place to put all personal belongings (you can take nothing but your ciothing with you into the shrine rooms). Now we are done climbing right!? Wrong. The interior of the temple is filled with very steep steps. The interior is built on a series of platforms for each of the shrine rooms. The climbing has, in fact, not ended. The very first steps past the guard station climb 200 feet in about 50 feet…it’s steep! The steps are oddly shaped and the stretch is difficult for smaller folks. We are all pretty spent at this point from all the climbing…and yet we continue. We entered four of the ten or so shrine rooms open to the public. The entrance to the Tiger’s Nest is closed on this day and so we have to comfort ourselves in seeing the doorway to it. Namgay tells us the stories of the shrines and the reasons for their placement. All too soon our visit has come to an end. It was as close to a kind of pilgrimage as many of us have ever done. We retrace our steps and move a bit more quickly to the base of the climb. It took us 3:00 hours to climb up and 1:45 hours to make it down. As we boarded the bus, silence descended on us all. We traveled a way down the Paro Valley to a farmhouse for a traditional lunch, archery, and a hot stone bath. Yes, a hot stone bath. This traditional form of bathing felt so good. You sit in a wooden tub, the hot stones piled at one end, separated from you with a wooden series of slats allowing the water to move between the stones and you. The bath was filled with wormwood leaves that left a wonderful scent and soothing calm on our bodies. Our traditional lunch included a kind of pork fat, dried meat, potatoes, red rice, vegetables, and peaches for dessert. All of the food was grown here in a wonderful non-pretentious take on farm to table. Every day in Bhutan are meals that are, literally, farm to table! Sonam, the son of the owners of this farmhouse, taught us how to shoot Bhutanese bows. The bows and arrows are handmade from bamboo by Sonam’s mother, Dorji Dema. She was in the Bejing Olympics in 2008 and represented Bhutan in archery. Through her notoriety, she is working to break down the very strict gender barriers between men and women in Bhutan, arguing that woman and men should compete together in archery, a sport that is not based on strength alone. Sonam hits the target; the ONLY one who did. \Our last evening in Bhutan was filled with some laughter around a table, something we’ve all grown to love. As we went to bed that night, as tired as we were, I imagine that we all reflected, for a minute, on what this trip has meant.